Nihon University Tokyo and Johannes Gutenberg University Mainz (JGU) are celebrating the 40th anniversary of the signing of their framework agreement on academic exchange in all the disciplines available at the two institutes of higher education. Professor Peter Schneider, the then President of JGU, and his counterpart Professor Marasu Suzuki of Nihon University signed the original agreement in June 1977, which was initially intended to encourage the mobility of students and professors as well as promote the study and dissemination of the Japanese and German languages. Over the past 40 years, this collaboration has ensured the exchange of more than 200 students and academics as well as the completion of successful joint projects in areas such as research and teaching in the field of Law and special events such as joint philosophy conferences. The framework agreement of 1977 was most recently updated in 2011. In 2014, it was supplemented by a special agreement relating to the disciplines of Law, Economics and Business Administration, and the Social Sciences. At the end of June 2017, JGU President Professor Georg Krausch and his current counterpart Professor Kichibee Otsuka, President of Nihon University in Tokyo, signed a memorandum in a ceremony celebrating the 40th anniversary of the partnership. "In view of the friendship and excellent academic cooperation generated in a wide range of fields as a result of these many years of close collaboration, Johannes Gutenberg University Mainz and Nihon University consider it appropriate to use the occasion of a visit by a delegation from Tokyo to emphasize the sustained importance of our bilateral academic collaboration and to ratify our joint intention of continuing and extending our successful work together to the benefit of both our universities," emphasized JGU President Professor Georg Krausch. "Both our universities are leading exponents of internationalization put into practice and we thus make a vital contribution to training our students to become global citizens. This is particularly important in times like these, in which populist and nationalist movements are becoming ever more powerful around the world." In principle, all disciplines at either university can participate in the exchange program. Law has become a special focus as the German legal system still has a major influence on that in Japan so that material for interesting comparisons of the two systems in research projects is available. 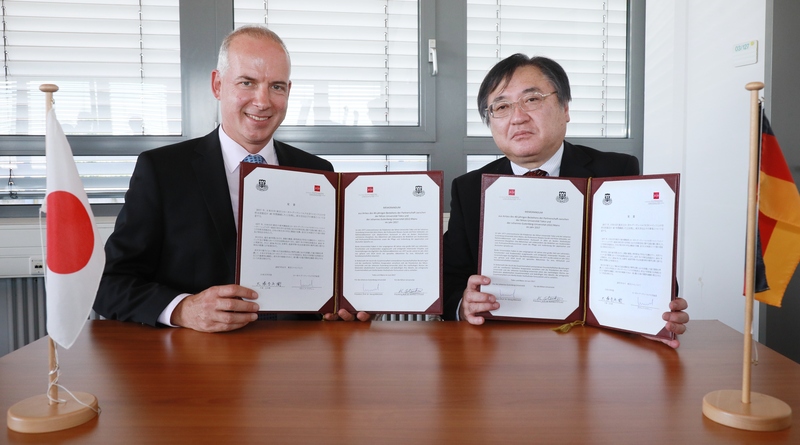 An ancillary agreement between the Mainz Academy of Arts and Nihon University is currently being negotiated that will further add to the options for collaboration. Starting in 1971, JGU has been offering Japanese language courses for its students and academics. Since 1990 they have also been able to obtain a Japanese Studies certificate that demonstrates that they are familiar with the basics of Japanese language and culture. For those who wish to apply to participate in the JGU-Nihon exchange program, the course also provides the opportunity to acquire the language skills required. Johannes Gutenberg University Mainz has established a collaborative network with partner universities and research institutes that stretches around the world. This network unfolds in joint research projects, the option of joint degrees, and the exchange of students and teaching staff. In addition to cross-disciplinary agreements with partner universities abroad, such as Nihon University Tokyo, JGU is also party to many other discipline-specific agreements and memoranda of academic cooperation. 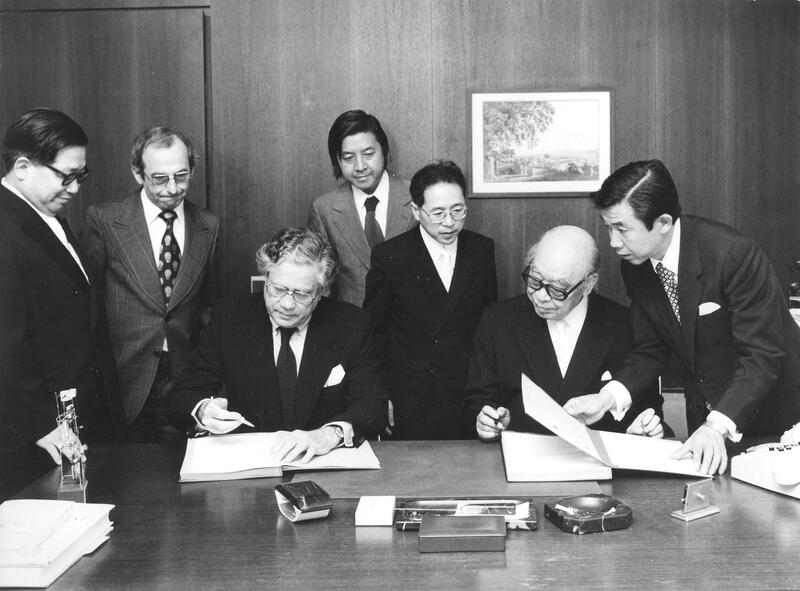 In June 1977, Professor Peter Schneider and Professor Masaru Suzuki (seated fltr) signed the framework agreement on academic exchange between Johannes Gutenberg University Mainz and Nihon University in Tokyo. 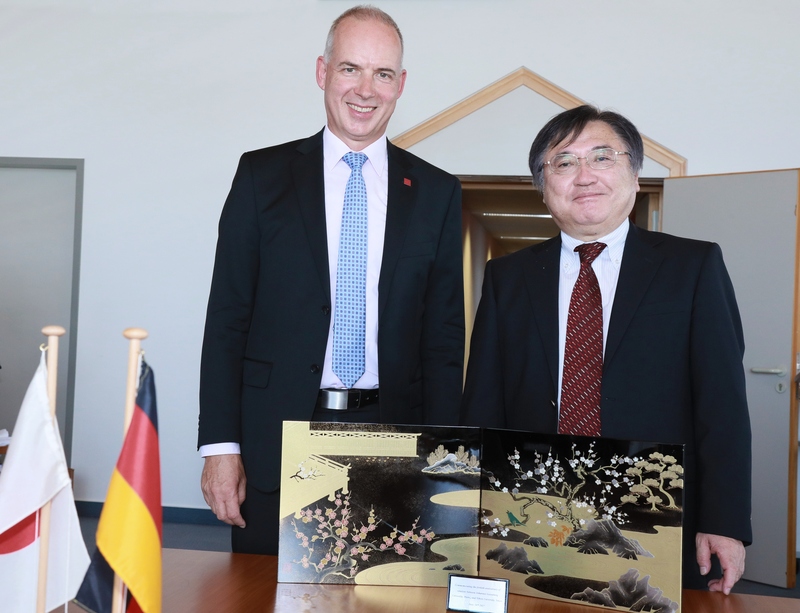 Professor Kichibee Otsuka, President of Nihon University, showed his gratitude for the invitation to Mainz by presenting JGU President Professor Georg Krausch with a landscape painting made using the traditional Hatsune lacquer technique.